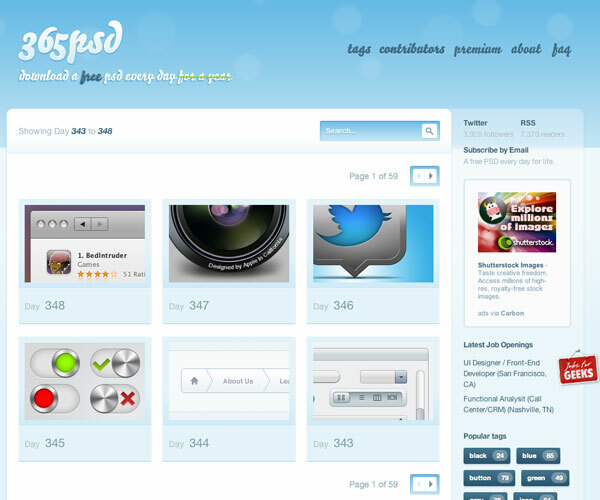 365psd is a site that gives away a free Photoshop file every day of the year. Submitted by a variety of designers, the service offers other designers an easy way to beef up their collection of resources for use in both commercial and non-commercial projects. 365psd was founded by Jonno Riekwel, a designer who was fed up with the growing pile of unused designs, discarded from projects that he’d poured hours into, sitting on his hard drive. The site was initially a personal endeavor to give away an unused Photoshop file every day for a year. (Update: Riekwel tells us that he has now sold the site although its purpose remains unchanged). The site has since grown to include over 160 contributors and hundreds more freely available files. In the process, the site has added high-quality premium files to the mix–collections such as this one that includes the site’s first 340 files for $8, and components such as this iPhone playlist design and these buttons for $3 and $1 respectively. 365psd offers everything from icon to web UI elements. If your design resource library is a bit lacking, the site is well worth a look.